The high season is between May and October in Vienna, period in which it is best to book in advance if you want to sleep in a hotel of the downtown area (in the avenues of the Ringstrasse). Luxury hotels are the norm in the centre of Vienna. Ancient and modern buildings offer to customers willing to spend all the comforts they want, in areas ranging from the imperial classic to the high technological. Who does not want to spend a fortune, however, can choose a budget hotel, in Schönbrunn, or a hostel next to the Spittelau or Westbahnhof stations. 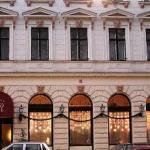 Luxury Hotels in Vienna: the old town centre of Vienna is a succession of 4-5 star hotels: such as in few other European cities. Prices are quite high, but those staying in one of these hotels has the assurance of an excellent service and all possible comforts for a pleasant stay. The nineteenth-century buildings have been restored and those that were not originally hotels now have large and comfortable rooms. The museum areas, those close to Stadtpark and Burggarten parks, behind Michaelerplatz, are very quiet. Otherwise, if you want to go out and immediately find busy streets full of people, you can opt for the central avenues as Wipplingerstasse or Wollzeile. It is also important to know that the entire downtown area has a circumference of not more than a kilometer in diameter! 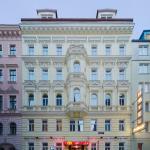 Cheap hotels and hostels in Vienna: there are several opportunities for those who want to spend less money. Outside the old town centre, in the region of Schönbrunn and Grinzing, and around the university botanical garden (next to the Währinger Park), there are very dignified and elegant 2-3 stars hotels, perfectly connected to historical center by public transport. Another option is to find accommodation in one of the several well-maintained hostels in Vienna: but even for these it is best to check beforehand whether there are available rooms, because they are highly sought-after by students, but also by families wishing to spend a few days in town. Also near the stations, Railway Station (Southward), Spittelau (Northward) and Westbahnhof (Westward), there are cheaper hotels. Design Hotels in Vienna: such as in other European cities, the design hotels are spreading throughout Vienna: these are lodging solutions located in historic houses, renovated on the basis of drafts of famous architectural firms, both local and international. Staying at these hotels is an interesting experience, but it is generally quite expensive! For your trip, check the offers for low cost flights to Vienna by Traveleurope. 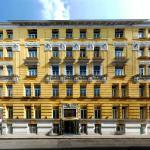 Rothensteiner Hotel rises in Vienna, in the middle of the seventh district which allows easy reach of the main attractions of the city. The area is well-served by public transport and many shops are nearby. 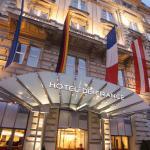 Austria Trend Hotel Beim Theresianum is an ideal base for a cultural stay in Vienna; in fact, from here you can easily visit the famous Belvedere Castle and other attractions thanks to the nearby metro stations. Out of the train station Westbahnhof of Vienna, you will be welcomed by the Pension Pharmador, a short walk from the shopping street Mariahilferstrasse. Nearby there is the subway station Burggasse / Stadthalle.